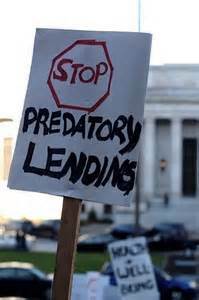 PREDATORY REFORMERS (also see: predatorial policy or predatory policy makers). Let’s (re)define this now in more analogues terms. The “lenders” are the U.S. Department of Education, certain politicians, and billionaires (or the think-tanks they fund) who “lend” monies to push (using unfair, deceptive or fraudulent measures) for certain polices or practices in exchange for self-serving or profitable benefits. Who are the borrowers? Children, teachers, tax payers, schools and communities who are convinced they need to agree to unfair or abusive terms. The most painful parallel is how predators as lenders and as education policy makers start with those who they perceived as the easiest “prey”: lower- income largely black and brown communities. Hard working and struggling individuals who are deceptively led into believing that here is the answer to their prayers, the salve for their struggle. They too can “have the American Dream—no really, it’s easy…just sign here.” Predatory lenders often target senior citizens and people of color to place them in unnecessarily expensive loans. So how are “reformers” and reform policies predatory? Too many ways to count. But I’ll focus on the top few. The latest round of ALEC legislation is also an excellent example of predatory policy. As part of their new “student achievement backpack” they propose changes that would enable private entities (online and edutech companies) to serve in public schools as LEA’s thus enabling them to not only get paid to replace experienced professional public school teachers, but they’ll get oodles of data in return (remember-this predator feeds on money and data). Through the “robust and comprehensive data collection” ALEC aims to allow predatory behaviors into your child’s classroom, where students will be seen not as learners but as “consumers” of the goods and products being sold via these companies. Parent Trigger. The greatest heist foisted upon parents in many years. The ultimate in deceptive advertising. Spawned in the bowels of ALEC and promoted by many think tanks such as The Heritage Foundation. Parent Trigger sold many communities into believing that this policy would place education decision making back in their hands, locally, where it belongs. Hey, they even made an all star movie Won’t Back Down. Parents are used as patsies to do the dirty work for corporations who, once the public schools are closed, swoop down and claim their rightful space as colonizers of their brave new world. While many parents across the country have begun to fight back, still many other states continue to see this policy as “empowerment ” for communities. Co-location, charters, and turn-arounds. Remember, “Predatory mortgage lending practices strip borrowers of home equity and threaten families with foreclosure, destabilizing the very communities that are beginning to enjoy the fruits of our nation’s economic success.” Similarly, lending agreements with RtTT funds require that more schools be co-located with charters, and expanse of charter schools, and higher rates of “forclosure” on schools which were never equitably funded to begin with. The hedge fund managers who finance the giant charter chains and charter CEO’s profit handsomely by bilking millions from tax payers for which they are rarely held accountable. As a result of these measures, communities are becoming destabilized, and are faced with the loss of community schools and increased race and class segregation as the result of the charters. Common Core and PARCC/SBAC. The standards and the tests must always be seen as intertwined. Because they are. Common core uses deceptive advertising like “world class standards” and “state led” to lure buyers into a bad deal. And with the agreement to use PARCC or SBAC, the terms of the loan will prove impossible to repay. The costs associated with the new standards and the testing require technological infrastructure, monstrous loads of data collection, endless need for training and retraining, new and shinier curricular materials…NO state can afford the costs. Once the federal funding runs out in 2014-2105, who will pay for all this new stuff? How will we pay for the metaphorical new garage, the built-in pool, or the roof (which when we bought the place didn’t know it had huge leaks…)? Corporations like McKinsey and Co (king of the predator food chain) will step in and “take over” PARCC and SBAC in many states, funneling millions to their bank accounts to help “fix the pool, the garage, and the roof”—for a small fee of course. Additionally, when children “fail” to meet the expectations (cut off scores, VAM) of the new tests, it’s like not being able to “make the payment.” Time to kick them out and parcel them out to private interests. Public into private, school to prison, public educator into TFA…the list goes on. Both the feds and the free-market corporations are predators it seems. It’s a blend of capitalism and federal overstep at their worst. After a few drinks, they mated. And they’ve bred a strange beast. Don’t try to feed it. It’ll bite your hand off. It’s a predator. And you can see the effects of predatory policy coming to fruition. The terms of agreement in each instance are deceiving, unfair and impossible to meet. Or.. we’ve realize we’ve been duped and refuse to meet them. Either way, our public education system, our schools, our children, and our democracy are on the foreclosure auction block- for sale to the highest bidder. And we’re left out in the cold. So the next time someone asks you what “reform” can be called, call it what it is-PREDATORY. “I’ve been assured by a very knowing American of my acquaintance in London, that a young healthy child well nursed and at least a year old is a most delicious, nourishing, and wholesome food, whether stewed, roasted, baked or boiled: and I make no doubt that it will equally serve in a fricassee or a ragout.”—Jonathan Swift. Bingo! Spreading this widely . . . Besides all the amazing things you say and the analogies you draw, many thanks for solving one of the writing and speaking conundrums of being an education activist. Thank you! The Global Powerhouse Designing our Ed Reform Landscape: McKinsey and Co.